Do you need to start your day with coffee or an energy drink? Try wheatgrass for a healthy energizing alternative. Wheat or barley grass planted in a pastel tray is a popular decoration for Easter. But what do you do with it after the holiday? Instead of throwing it out, use it in a smoothie or juice it. What grass and barley are a great source of energy and filled with vitamins, minerals, and life-giving chlorophyll. It really comes alive when you drink it, so take it before exercise or first thing in the morning. If you use a blender, mix it with water to your desired thickness. 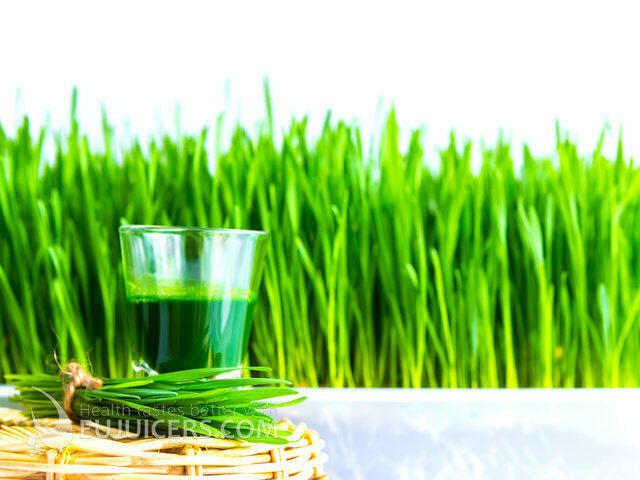 You can drink wheatgrass juice directly as a shot or blended with water in a smoothie, but the taste is very strong. If you prefer, you can add it to fruit or vegetable juice to make it more palatable. Using a juicer, first juice the the celery and letuce. Then alternate carrots with wheatgrass. If using a blender, just mix all the ingredients with water and blend at high speed until smooth. Caution: Don't pick baby wheat or barley that has been commercially planted, as it may have been treated with chemicals. Wheatgrass is best juiced using a twin-gear juicer such as the Angel Juicer or Omega TWN. An inexpensive alternative is the Kojo Juicer. If you plan to juice wheatgrass often a dedicated wheatgrass machine such as the Wheatgrass BL-30 (shown) or the Z-Star are fine choices. 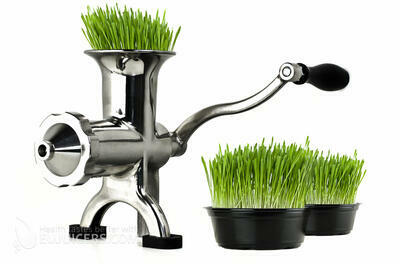 A horizontal single auger juicer will also give acceptable results provided you cut the wheatgrass into small pieces. On the other hand, don't try to juice wheatgrass with a centrifugal - it isn't at all suited for it.